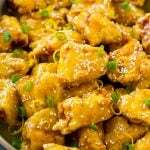 This Chinese lemon chicken is crispy battered chicken breast pieces smothered in a sweet and tangy lemon sauce. A remake of the take out classic that tastes just as good as what you’d get in a restaurant! I always order lemon chicken at Chinese restaurants, but it’s actually quite easy to make at home! Add some steamed rice and veggies for a complete meal that the whole family will love. I am on a quest to make all my Chinese food favorites at home. So far I’ve conquered some of the classics like beef and broccoli, kung pao shrimp and egg rolls. Next up is this crispy Chinese lemon chicken, and it’s a good one! 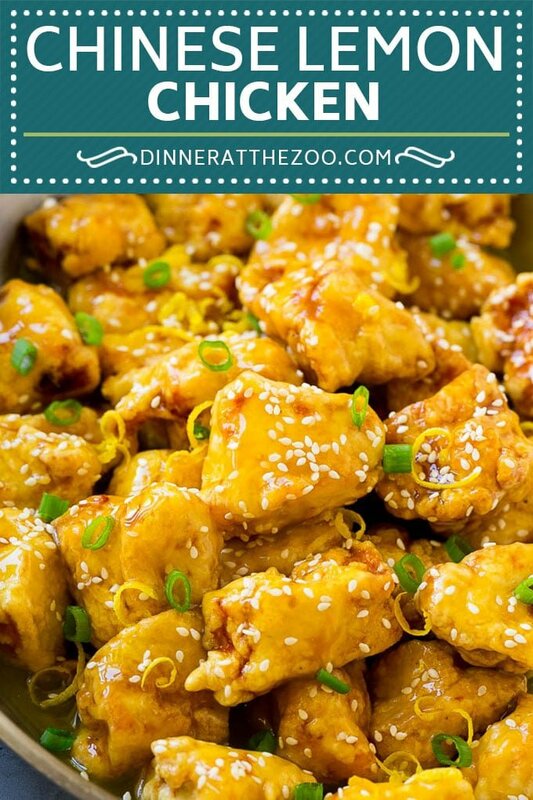 How do you make Chinese lemon chicken? 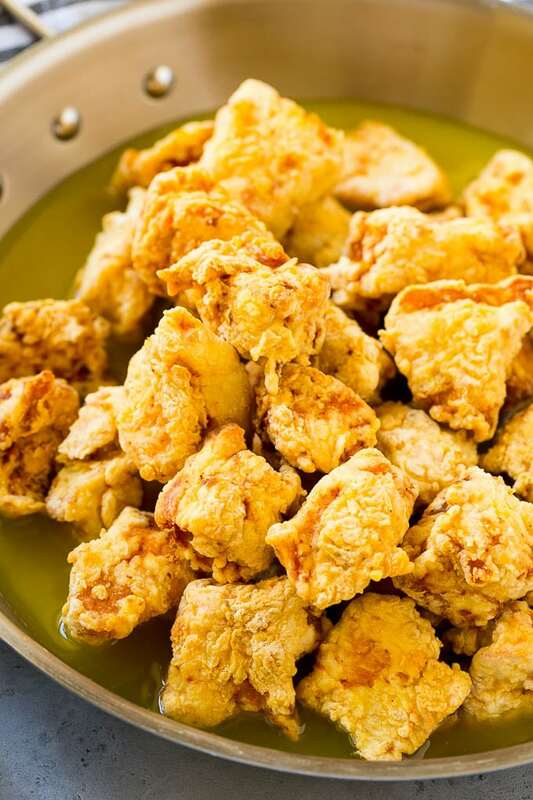 The first step to making Chinese lemon chicken is to batter and fry your chicken pieces. I use chunks of boneless skinless chicken breasts, but chicken thighs will also work just fine. 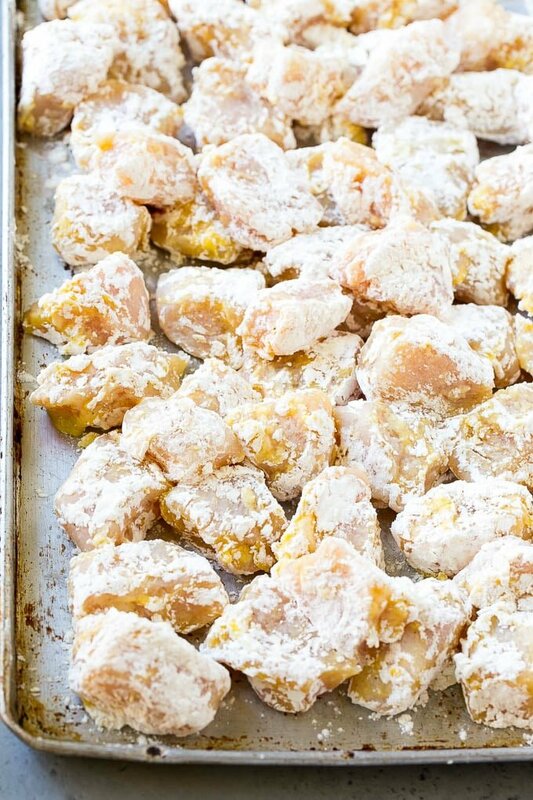 The chicken pieces are dipped in a seasoned egg mixture, then coated in a blend of cornstarch and flour. The chicken pieces then go into hot oil and get fried to crispy perfection. I use canola or vegetable oil for frying, and I always use a thermometer so I can keep track of how hot the oil is. The oil should be in the 350-375 degrees F range. If the oil is too hot, the coating will burn before the chicken is cooked through. 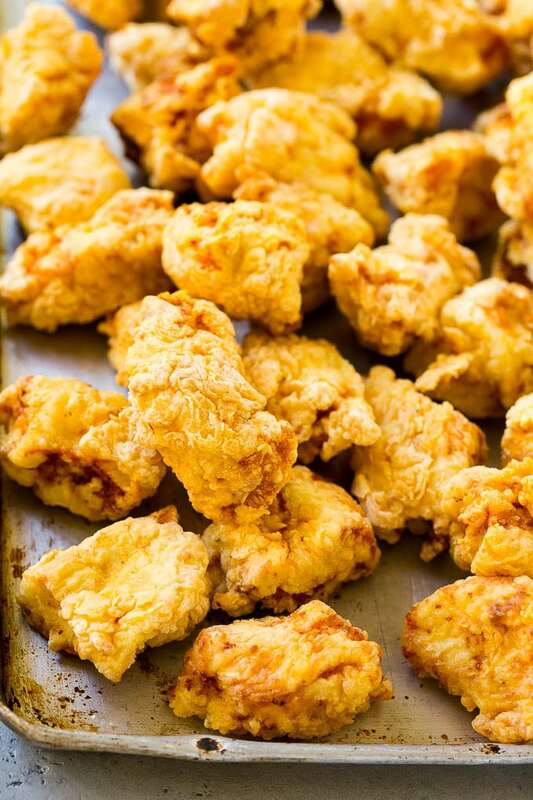 If the oil is too cold, the chicken coating will absorb a lot more of the oil and be greasy. What is a lemon sauce? While the chicken is frying, I make my lemon sauce, which is a simple mixture of fresh lemon juice, sugar, water and cornstarch. Do not be tempted to use store-bought lemon juice here, fresh squeezed lemon juice is an absolute must. The sauce may look a little pale in color compared to the chicken at your Chinese restaurant. This is because some restaurants use yellow food coloring to enhance the color of the sauce, which I haven’t done in this recipe. 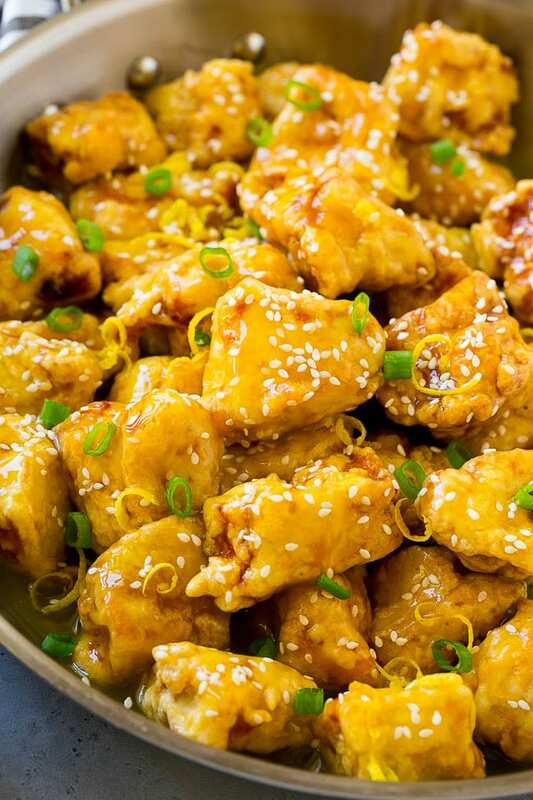 The chicken gets coated in the lemon sauce and then topped with lemon zest, green onions and sesame seeds for garnish. What goes well with lemon chicken? My favorite way to serve Chinese lemon chicken is over steamed rice. I also serve a simple steamed veggie like broccoli or asparagus. You could also serve this lemon chicken with a side of Chinese noodles such as chow mein. 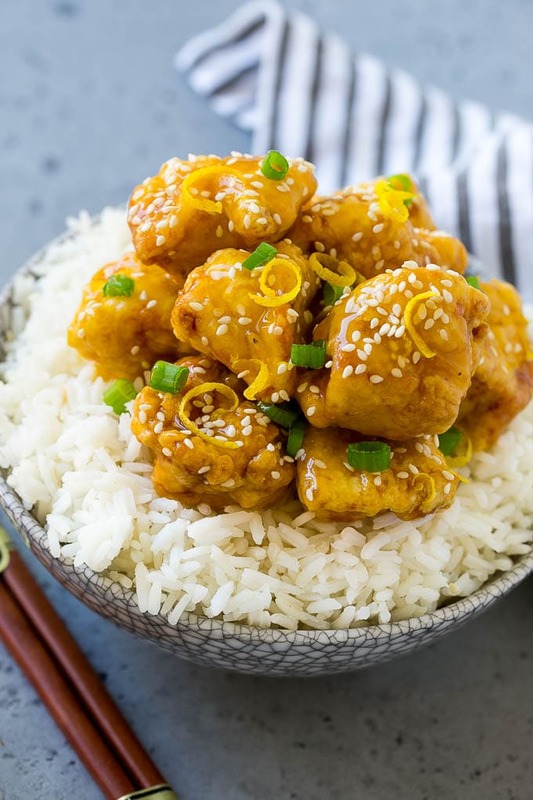 This Chinese lemon chicken is best served immediately, as the crispy coating on the chicken will start to soften once it’s tossed with the sauce. Your whole family will go crazy for this crispy lemon chicken! There’s no need to call for takeout when it’s so easy to make your own Chinese food at home. This Chinese lemon chicken is crispy battered chicken breast pieces smothered in a sweet and tangy lemon sauce. A remake of the take out classic that tastes just as good as what you'd get in a restaurant! Place the eggs, salt and pepper in a bowl. Stir to combine. Place the flour and 1/2 cup of cornstarch in a shallow bowl or on a plate. Stir to combine. Dip each piece of chicken into the egg mixture, then into the flour. Repeat the process with all of the chicken. Heat 3 inches of oil in a deep pan to 350 degrees F.
Add 7-8 pieces of chicken to the pan. Cook for 5 minutes or until crispy and golden brown. Repeat the process with the remaining chicken. While the chicken is cooking, make the sauce. Place the lemon juice, sugar and water in a small saucepan and bring to a simmer. Mix 1 tablespoon of cornstarch with 2 tablespoons of cold water. Pour the cornstarch mixture into the lemon juice mixture. Bring the sauce to a boil. Cook, stirring constantly, for 1-2 minutes or until sauce has thickened. Toss the lemon sauce with the chicken. Stir in the lemon zest. Sprinkle with sesame seeds and green onions, then serve immediately. Thank you so much for this wonderful recipe! Such a treat to have it fresh and the zing of the real lemon was fantastic. Was really fun to make and will definitely make again. Why post a review when you haven’t even made it. What do you think reviews are for? Here’s mine. It’s easy and tastes like authentic lemon chicken you would get at a higher end Chinese restaurant. Followed the directions exactly and had no changes or leftovers for that matter. Served with rice and steamed snap peas. Definitely a keeper. 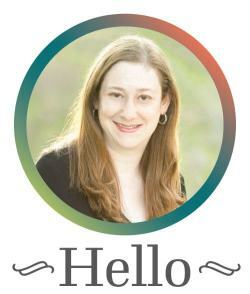 Kudos to Sara! !